Release your inner Cookie Monster! 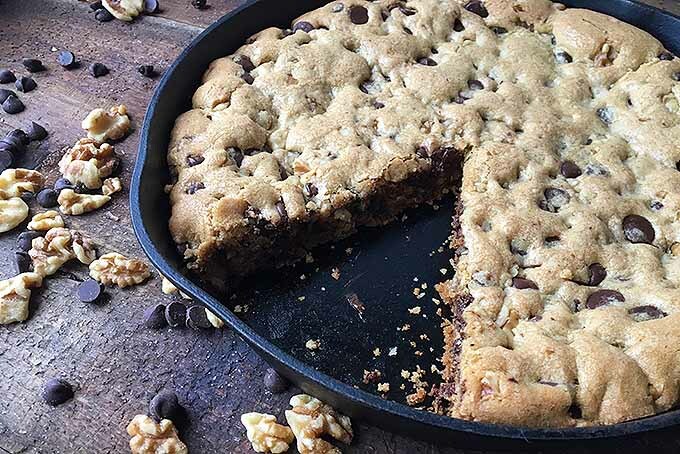 Our recipe for a GIANT chocolate chip cookie baked in a cast iron pan will melt the hearts of all dessert lovers. 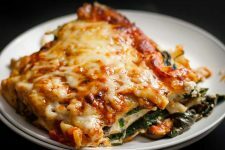 While you can use any oven-safe dish, baking in a heavy, cast iron skillet gives you a delicious advantage. It helps create a crispy, buttery crust on the bottom and sides, while keeping the inside soft, and ooey-gooey – just the way we like it! Sliced in wedges and served warm with a scoop of ice cream (or a creamy semifreddo! ), we can’t think of a better treat to serve at your next party. 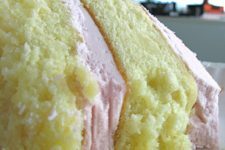 Sorry, vanilla cake… maybe another time! Me want cookie! And I’m sure you do, too – follow our recipe below for the ultimate sweet indulgence. 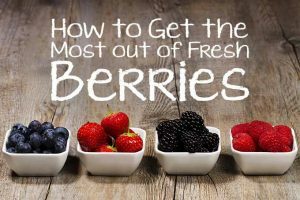 Need a quick and easy dessert? 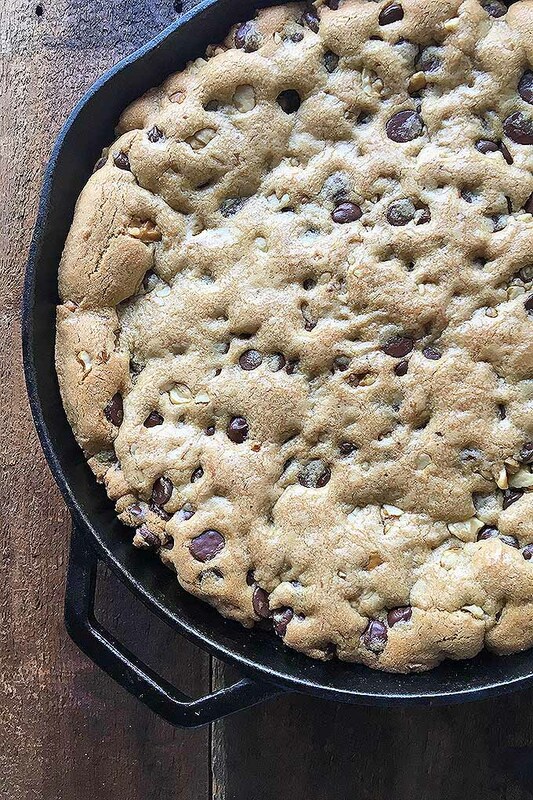 Make a giant chocolate chip cookie baked in a pan. Serve it with ice cream for the ultimate sweet indulgence. Place the butter, granulated sugar, and brown sugar in a bowl of a stand mixer fitted with a paddle attachment. Beat on high speed until light and fluffy. Add the egg and vanilla extract. Mix until fully incorporated. In a separate bowl, combine the flour, baking soda, and salt. Add the dry ingredients into the butter mixture. Mix until fully incorporated. 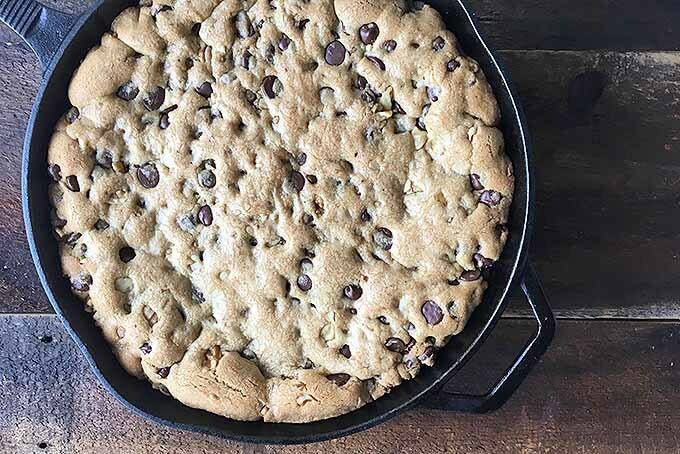 Place the dough in a greased 10-inch cast iron skillet, or any oven-safe pan of a similar size. 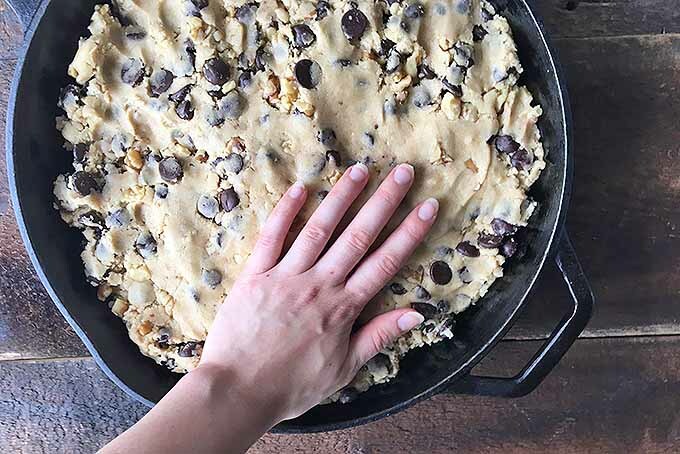 Evenly distribute the cookie dough in the pan, pressing down with your hands. Bake for 25-30 minutes, until the edges are a golden-brown color. Remove from the oven, and let cool slightly for 10 minutes. 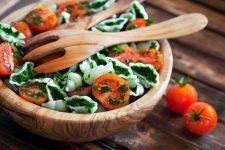 Cut into wedges and serve! 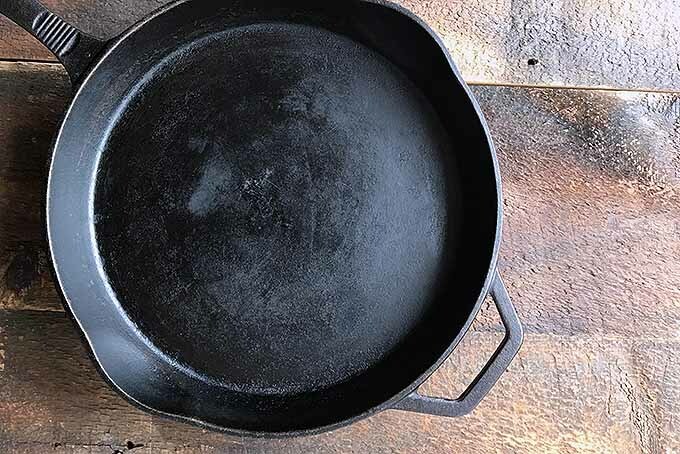 If your cast iron skillet is seasoned properly, you will not have to worry about greasing it. If desired, rub a thin layer of butter or a neutral oil like vegetable oil to prevent any sticking. 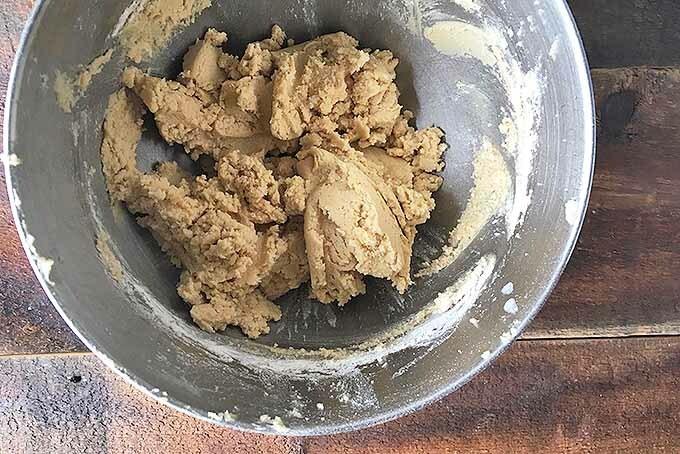 Using a stand mixer fitted with a paddle attachment, beat the butter and the granulated and brown sugars on high speed until the mixture is light and fluffy. Add the egg and vanilla extract to the butter and sugar mixture. 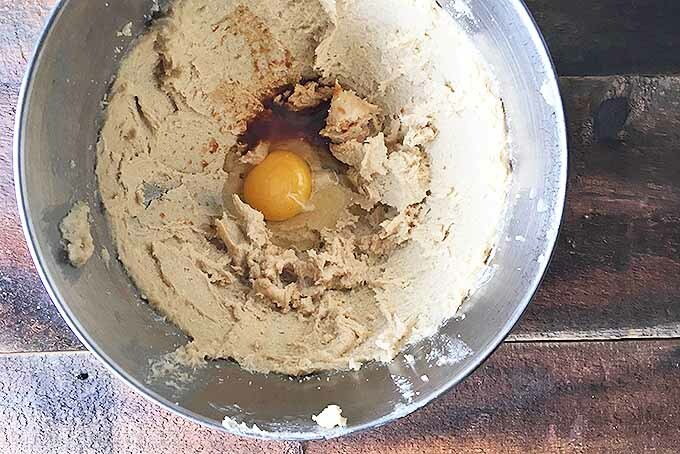 Beat on high speed until the egg is completely incorporated, and the dough is smooth. In a separate bowl, whisk together the all-purpose flour, baking soda, and salt to create an evenly distributed dry mixture. Add this to the butter mixture. 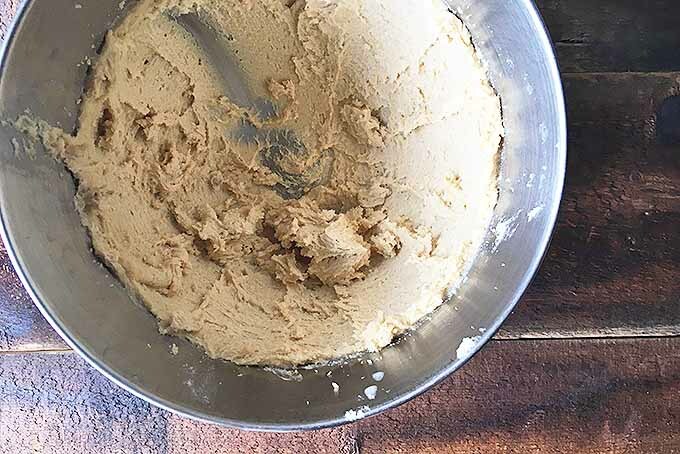 Mix on medium speed until a smooth, thick dough forms. Do not overmix. Add the chocolate chips and chopped walnuts. Mix briefly on medium speed until evenly incorporated. Drop the dough in the prepared pan. Using your hands, press down the dough, making sure it forms an even layer. Bake for 25 to 30 minutes, until the edges are a golden-brown color, and the top is a very light beige color. Don’t overbake it! It will continue to cook once it is removed from the oven. 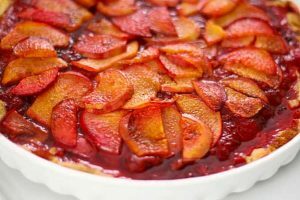 If you need some help with this whole baking process, take a look at our guide on 15 tips to improve your baking routine! Like it extra gooey? Reduce the baking time by a few minutes. Let it cool just slightly, about 5 to 10 minutes. Slice into wedges, and enjoy while warm! Serve with a side of ice cream. That cast iron pan of yours is more than ready for the dessert course. So feed your inner monster by baking a batch of our giant chocolate chip treat. Once you let it cool slightly out of the oven, you are free to indulge as much as possible! 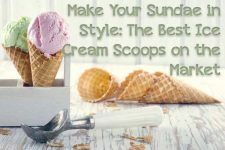 Put a hefty dollop of your favorite homemade ice cream right on top, let it melt slightly, then dig in. It’s an ooey-gooey paradise, and we never want to leave! And if you follow a strict diet, you can still enjoy this dessert experience. 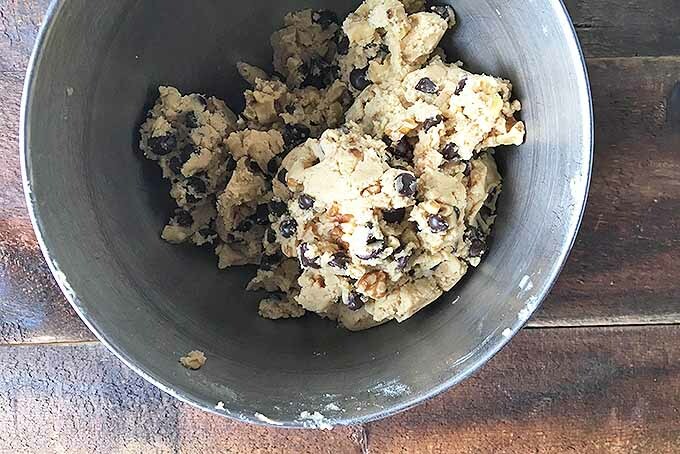 Simply replace the dough in this recipe with our paleo version – no dairy, no wheat, and no egg! Need help taking care of your cast iron? Read up on the proper cleaning and caring of this special cooking equipment. In what other creative ways do you like to transform your typical cookie recipe? Let us know in the comments below! Photos by Nikki Cervone, © Ask the Experts, LLC. ALL RIGHTS RESERVED. See our TOS for more details. Originally published July 6th, 2015 by Jennifer Swartvagher. Revised and updated August 14th, 2017 by Nikki Cervone. This looks amazing. I have a favorite restaurant I go to once and awhile. They have something like this, but this looks like it is going to taste even better. Homemade always is. There’s doesn’t have the nuts in the cookie which is a nice touch. Yummy. Brown sugar and sugar in this one, hmmmm. Vanilla extract you can also replace with real maple syrup. I also really like how you just put it in a skillet. This is so easy. Trouble is you want to eat the whole thing. I can make desert in my cast iron?? Ahh just when I thought I had found all the uses you post this! It’s going to be my Sunday brunch desert, the friends are going to flip. I am lucky enough to live close to a top notch ice cream place, that makes delicious stuff from scratch at a great price. So I will cheat and pick up a tub of their Dominican vanilla. Wow, a pan cookie! What an amazing idea! Bear in mind that I’m in the UK and the only “big” cookies we see are those sold at Millies. What a fantastic thing to make whilst camping out though. You could even just bring pre-made dough with you, I’m sure it would be fine in a cool box. I would love to try this out sometime. I like the idea of pan cookies. Plus, I have a cast iron pan at home. 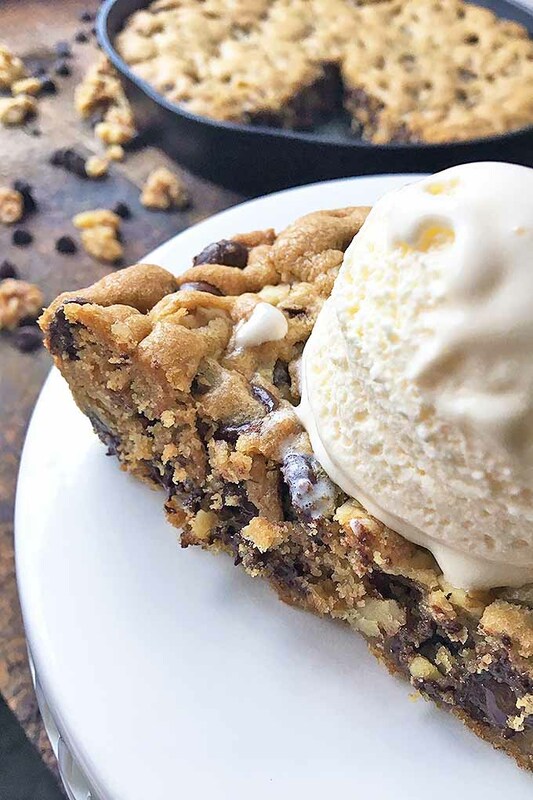 Cookies topped with ice cream sounds so good right now. I would drizzle some dark chocolate as a topping, at least on my piece anyway. Thank you Jasmine for bringing that to light… dark chocolate…mmmh..and my mind goes on a trip…or perhaps chocolate fondue, I believe there are a variety of toppings one can use for this pan cookie but I’m positive you can’t go wrong with chocolate 😉 . Mmm, I love that the ingredients are those I have on hand, and the preparation is easy. This looks and sounds delicious. I’m sure your son appreciates the homemade versions so much more than store bought. 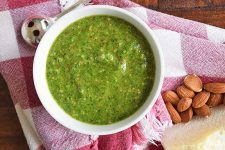 I relish the idea of making this, and topping it with some delicious ice cream, and I know the family will enjoy it! I am really liking this idea. I’ve never done it in my skillet, but I have made giant-sized cookies before. I’m going to try it your way. Topping it off is genius. This would be the perfect as a birthday treat for one of my girls who doesn’t really like cake very much. Just decorate it, add candles, and bam. Perfect. This looks so dang good! There’s a restaurant I like in Detroit where my family lives that has a pan cookie like this. It is delicious! I think if I made this one at home, I would have trouble not eating the whole entire thing! I might have to save this recipe for a cold, Winter night. OMG, I would seriously stab someone for that cookie if they had one right here. Just theoretically, of course. I keep my stabby impulses under control. The last time I had a pan cookie was in a restaurant were they serve it in the pan and as a result I burned myself trying to chip it out (it was also totally too small, if I am having a separately cooked pan cookie I want it to be ginormous, thank you very much). So it is probably time I learned how to make my own. Oh wow. I had no idea that a Pan Cookie could even be done. It looks amazing and I honestly did not expect it to come out as it did. The ice cream on top is also great addition. I’m really excited to try this out as my next family dessert. I have no doubt that they will love it! I’ve never heard of pan cookies before, but this looks really delicious. I don’t own a cast iron skillet at the moment, I generally just make do with steel pots and non-stick pans, but it looks like I’m going to have to buy one now… The homemade ice-cream looks like a great touch. 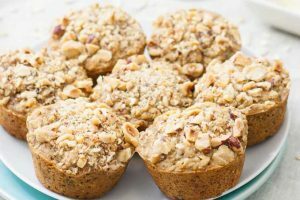 I also absolutely love nuts in cookies, so I can’t wait to try this out! This…is a thing I’ve never heard of, but I wish I did. Just to clarify, after you bake it for thirty minutes, are you suppose to cook the cookie on top of the stove for 15 minutes or let it sit? 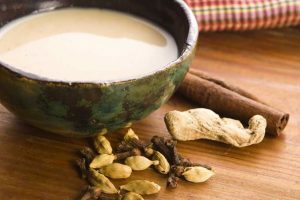 Sorry if it seems like a foolish question, but I just wanted to make sure since I really want to try this recipe out as soon as I have the chance. I wonder if it will still come out well if I used a boxed cookie mix but add stuff like white chocolate chips to the mix. I don’t have and Iron skillet, but hopefully my other pans will be up to the task, so long as a coat it generously with butter. One thing that I love is cookies and icecream. Especially homemade! I really am excited to try this one out. I am really starting to get into making as much as I can from scratch. 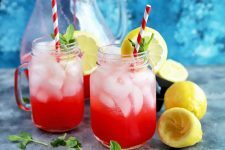 So, thanks for this delicious looking recipe! I have never tried cookies and ice cream but now I just HAVE to. 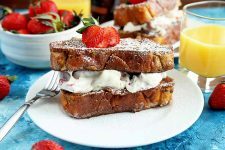 It looks so delicious and seems perfect for those sweet-tooth cravings. I’d say you could vary the toppings such as M&Ms and Oreo bits. 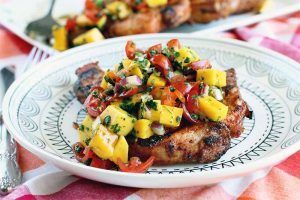 Defiantly adding this one to my list of favorite recipes! Baking is my passion and once I get a cast iron skillet I am going to make this recipe. I have never tried to make homemade ice cream, but I will definitely try it with this recipe. I’m going to try this recipe out as soon as humanly possible, it looks delicious. I’ve been addicted to the pan cookies at Boston Pizza lately (they call it the “Panookie” haha), making them at home would probably be a lot cheaper. I’m glad the recipe doesn’t call for an overwhelming amount of flour, I find baked goods with even a little too much taste too…grainy? There are so many chocolate chips, yum! The recipes on this site are going to make me gain some weight. My excuse is that I need it to last through the cold Canadian winter. Perfect excuse for me to make some homemade ice cream, which is always so much better than store bought! 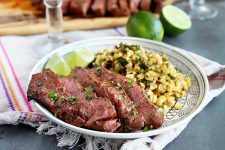 Will definitely try out this recipe since I’ve been meaning to try one of these for a while. Will have to have this before the new year before it ruins my New Years resolutions! 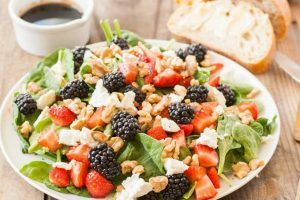 This is a super delicious looking idea. I am very happy for the recipe to be here. I know I will definitely be trying this out. Thank you so very much. I will enjoy making fresh, gooey cookies with some super smooth homemade ice cream. I hope you and your son get to make these as a fun project and enjoy the yummy-ness. 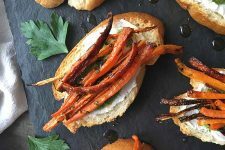 I swear, reading this blog with all it’s delectable food items is going to be the final nail in the coffin for my new years resolution to get healthy. I can’t live without eating all of this food! I’ve always been someone who thought that baking was an exact science, not as easy as just using a pan. It all appears so easy, and I’m very sure it is! I’m sure it will be lovely with some Vanilla ice cream and a slight dash of Lemon. Whoa, this looks fantastic! You couldn’t have posted this with better timing, too! I’m about to go on a camping trip myself and we just re-seasoned our cast iron cookware. Considering how much pie we eat in this household this will be a nice change of pace for desert. I sincerely look forward to trying this out. Wow what a delicious treat and change from traditional cookies. I usually make peanut butter cookies and my kids love them….but I think it is about time for a change. This desert is such a decadent treat I can’t wait to try. 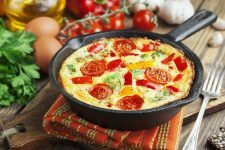 I have the same cast iron skillet that I will be using…..wonderful recipe…thanks so much. 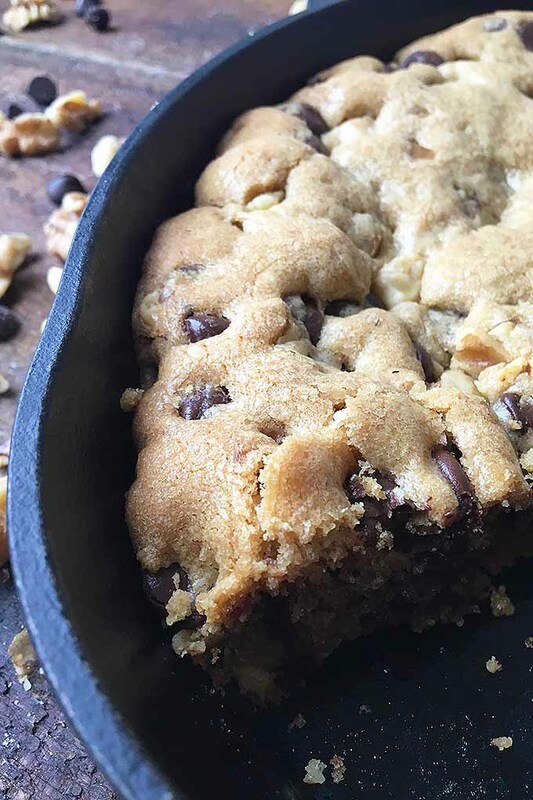 The fact that it is made in a cast iron skillet is so special and different…WOW! How funny.. I actually attempted to create something just like this two days ago but the cookie turned out to have the texture of a cake… Although I think I may have just used too much butter. 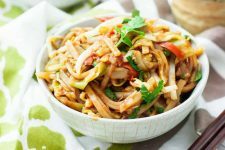 This recipe looks easy and delicious and I am going to actually attempt it today. Good thing my mother just gave to a set of cast iron skillets, I am so excited! 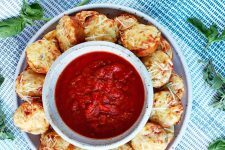 Thank you for this beautiful recipe! I’ve been looking for this dessert forever! -presumably because I thought it was an oven recipe. I only had it in a restaurant that just called it “cookie dough”, and since it was obviously warm I really thought it was some sort of cookie that didn’t completely bake through, which in my head explained the gooyeness. I’m sure this is a silly rookie question,, but – why use unsalted butter only to then add salt to the recipe? Is it just easier to measure if they’re separated? But then, this doesn’t seem like the sort of recipe in which measures need to be that exact. I was wondering if excess dough could be refrigerated, but it does have egg…maybe frozen? 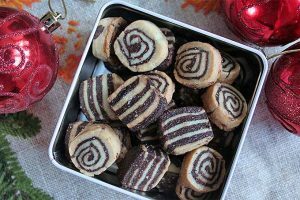 Pan cookies! This is yet another uncommon recipe for me. It doesn’t seem daunting to make though. While I’m not very good at baking, I think this is something I can try. I hope I don’t mess it up. 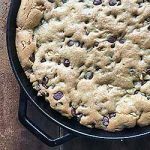 I love chocolate chip cookies, and this pan version is like one big chocolate chip cookie! Ah, I could just imagine having a time of life eating this with vanilla ice cream! I can’t do the homemade version though as I don’t have ice cream maker. 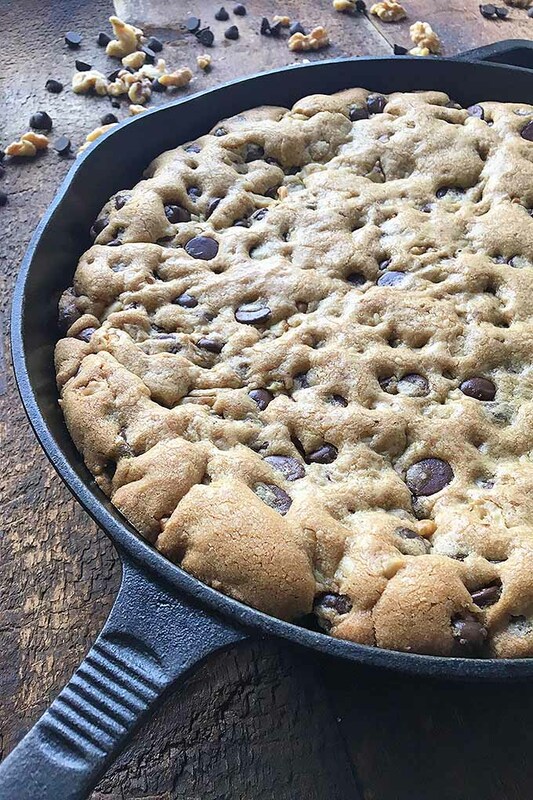 I would never have thought about using a skillet to make a cookie, that’s a really novel idea. I do love those cookies that are soft and doughy in the middle – and with ice cream too – definitely a winner for me! 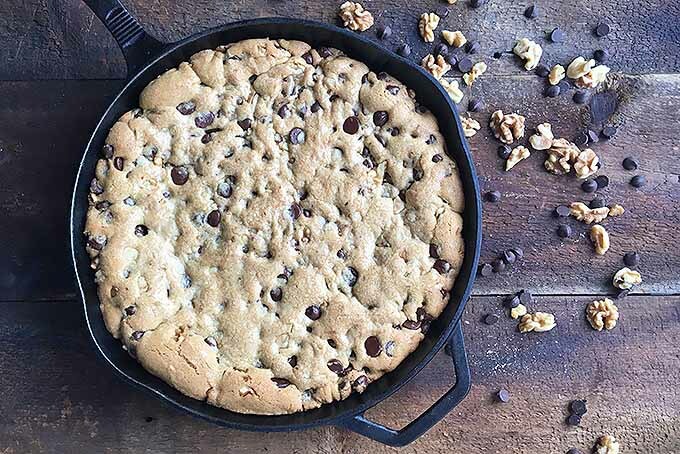 A cookie in a skillet? Well now I’ve seen it all. This is great! I’m certainly going to be trying this one first chance I get. It looks so yummy and I can just imagine it with the ice cream over it. Unfortunately, I can’t make my own ice cream yet but I know it will taste just as good with store-bought ice cream for now. 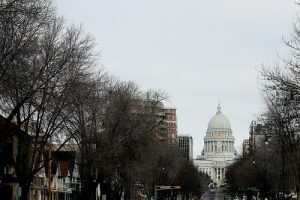 Great article, thank you for sharing it. We made this gluten free and oh my goodness, our entire family raved about it. It was easy to make (my 3, 5 and 12-year-olds helped). And we enjoyed every bite! OMG, ROSHELLE, YUM! I’m so happy the whole family helped (and enjoyed!) this homemade treat. I’m coming over the next time all of you make it!